I have 2 Google accounts. OK to log in account name and password fot the first account, but when I want to login to the second account the first account is shown. Even when I manually change to the 2nd Google account, the data for the first a/c still comes up. Help? I think we need a little more information to try and better understand what is happening. So you've signed into one Google account, you've logged out and you're now back at the standard sign-in form for Google. Is the issue that 1Password is filling the fields with details for the first account when you want it to fill using details for the second and if that is the case, can you tell me how you normally use 1Password to fill; do you use the keyboard shortcut ⌘\ to fill or do you normally click the 1Password button and select the desired Login item? If you normally use the keyboard shortcut and if you have two separate Login items for Google does 1Password always display 1Password mini when you fill on Google? It ought to when it finds to equally valid Login items so if it isn't we've possibly found where to focus the troubleshooting. If I'm misunderstanding at all please do correct me. Thank you yery much for your interest! You have understood my problem. I am on Mac, and don't use the keyboard shortcut you mention. I double click on the 2nd account in the main 1Password listing, and still get the start window for the first account. Maybe a cookie dictates this? So it sounds like you're using open-and-fill. Can you try something for me please. Sign into your first account as you normally would and log out, basically repeat the steps you normally use before the problem starts. Now instead of using 1Password visit https://accounts.google.com/ for me directly, without using 1Password. What does the page look like and it is different or the same to what you see when you use 1Password? I get the same (first account) result as I do with 1Password. So it sounds like cookies in the browser and that will be why when you use open-and-fill in 1Password you see the same. After you sign out of the first account you probably see a like this. You will need to click on your email address to be offered other options such as sign into another account or remove an account from the remembered list. 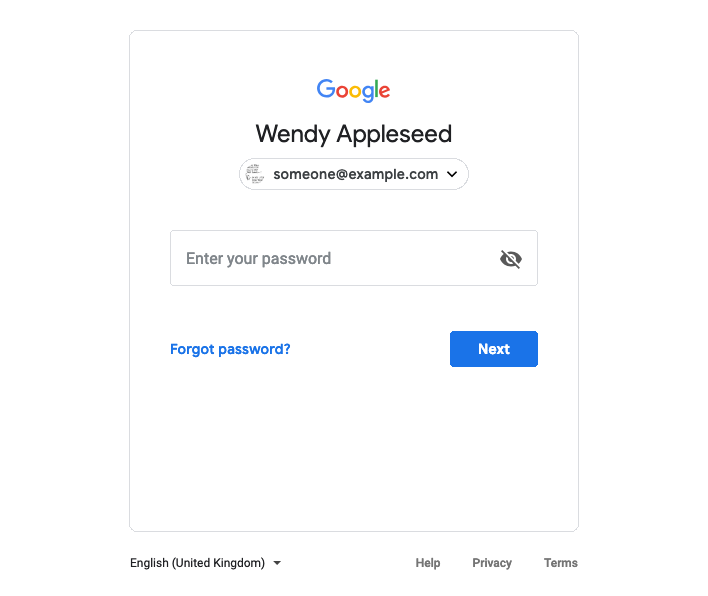 If Google had a directly visitable page that always displayed an empty sign-in form 1Password could work without that step but I don't know of such a URL myself or if it exists at all. This looks to be an example of where 1Password is limited by what site's behaviour. I have managed to set a Google signin site offering me direct both accounts to choose from. This is already a step forward., and I can live with it Thank you for your help, including on Sunday! Thanks for letting us know, @ronaldruffles! We're here if you'll need any further help.